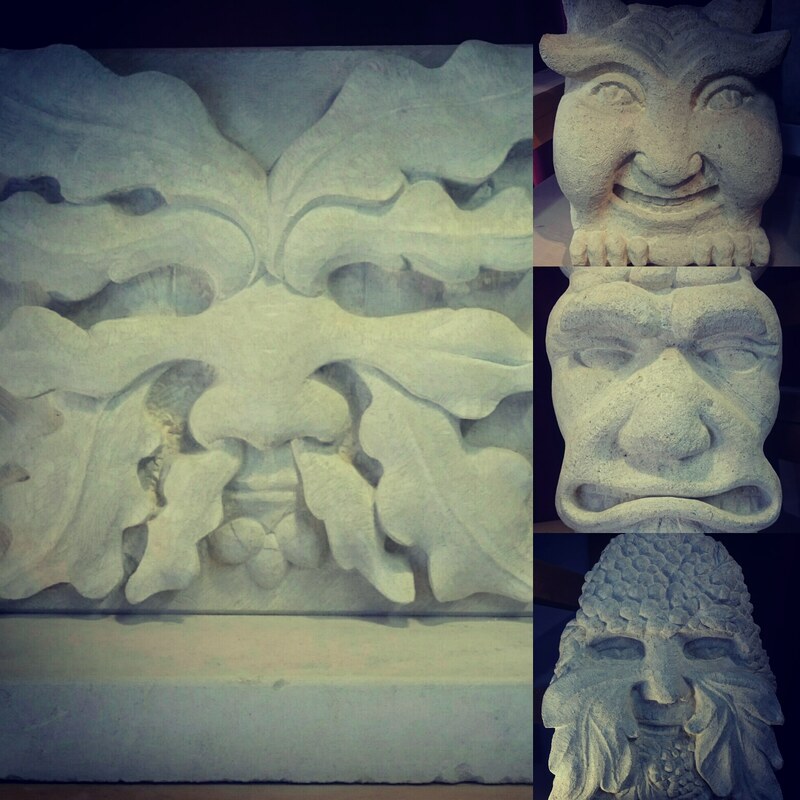 I have been asked to exhibit some of my carvings at the stone Industry’s most exciting event, The Natural Stone Show. This year for the first time there will be a sculptors studio. 6 of the country’s top stone carvers and letter cutters will have work on display and I am very proud to be included in this group. I will be there on all three days to chat to the visitors, explain about what I do and you will have the opportunity to purchase my carvings. I will be taking my newly completed Bacchus Green Man frieze as well as some of my faces and smaller pieces. 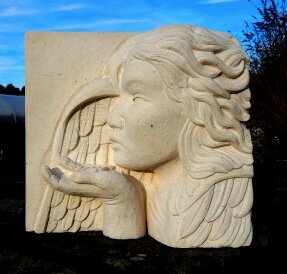 Angel blowing a leaf, hand carved Lepine limestone. Medieval woman. hand carved St Bees Sandstone. This takes place at Excel in London from the 30th of April – 2nd May. Really sorry that I haven’t posted in a while there is so much to do at the moment which is very exciting. I have just finished a very complicated memorial hand carved in Welsh slate, it was 21 inches square and took me 6 days. 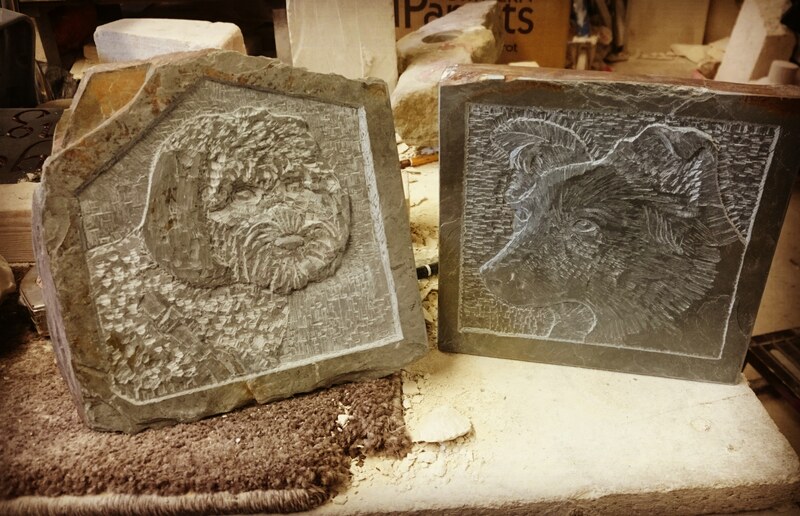 These dog portraits hand carved in Cornish slate were fun to do. I have also had my application for the Celebration of Craftsmanship and Design accepted. It is something that I have been wanting to take part in for many years. 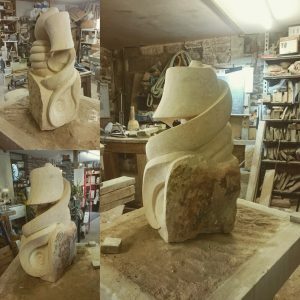 My sculptures will be my seashell and mother and child sculptures, using the spirals and curves that I love so much to carve. 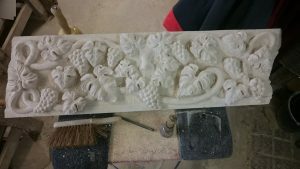 There will be three of my carvings indoors and 5 outdoors. I have started one of my new carvings and it has a fern like shape but will have a sense of a mother and child’s love. 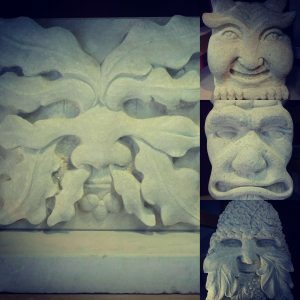 There are expenses such as the entry fee and new stone for my new sculptures so I am having a sale of some of my carvings. These are the lucky fellows who will help me pay for some new stone, my exhibition fee and of course the delivery of my 8 sculptures. The Green man with Rowan Berries has just sold (bottom right corner) but my Beastie on the middle right which is now only £500, my Green Man with Acorns and Oak leaves which is £650 and my cheeky grotesque (top right) which is now only £200 are still available. It is always difficult to reduce the cost of my carvings, not because I’m greedy but because they are all special in their own way and their worth and obviously the time spent can never be recovered in the price but they need to earn their living for me and I need to pay for this exhibition in order to progress my skill and designs. You’ll also be interested to see the development of my Bacchus Green man, while he remains unfinished I spend a few hours every week on him and hope to have him finished before the Summer. I have recently finished another one of my seashell inspired carvings, it is carved from a piece of the original Llanthony Secunda Priory that I was given last Summer after spending the day demonstrating at one of their open days. I decided to leave the bottom section un-worked as it has some beautiful 500 yr old tooling visible. There is also some pink discoloration from fire damage. I have a lot on my schedule at the moment but it is all so exciting. 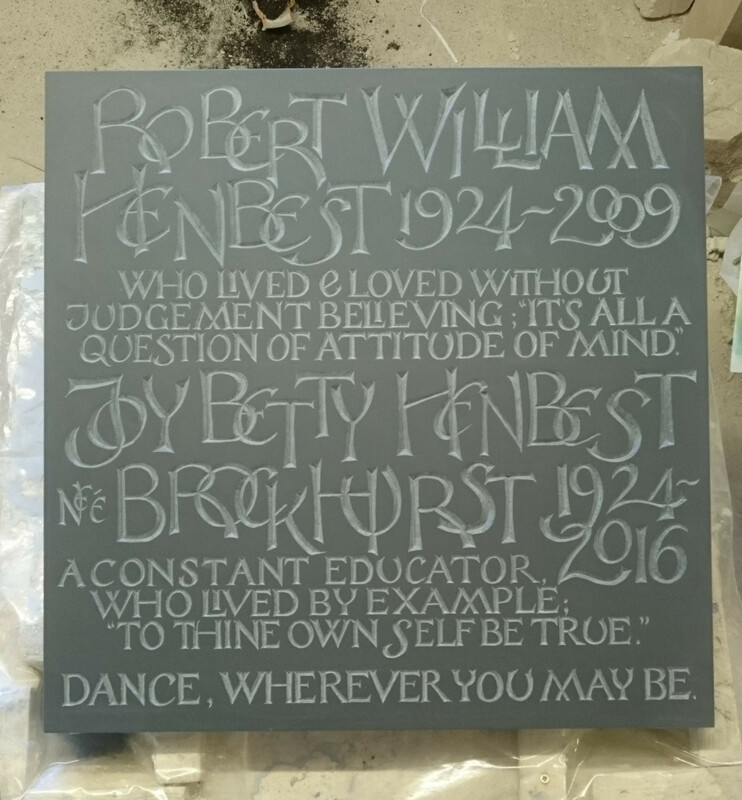 I hope that you will get in touch to discuss a commission or maybe you’d like to buy one of my sculptures but I do now have a 6 mth waiting list for commissions. As well as my carving schedule I am also taking part in a personal challenge. It ultimately raises money for DiabetesUK and it is a swimming challenge. I have struggled with my physical health for a number of years due to injury but through perseverance, determination and my partner’s support I am getting stronger. This challenge to swim 22 miles in 12 wks is just the thing I need to continue to push myself further. I have a just giving page, it would be great if you could sponsor me, I also keep it updated with my progress so you can follow me on this epic journey. Thank you for reading and please feel free to comment or ask questions I will reply. We flew into Innsbruck on Tuesday afternoon, the weather was overcast and snowy and the mountains looked incredible. There had been heavy snowfall and we were lucky as the airport was shut the day before. We took the train from Innsbruck to Brunico through the Alps, there was so much snow and beautiful cloud reaching mountain peaks. The sky was clearing and there was some blue sky and sunshine. When the wind blew the snow flurried off the mountain sides and there were columns of icicles hanging from every visible rock. Once we reached the border between Austria and Italy the snow began to clear, there were lorries and cars, transporters loaded with new vehicles. Unlike the UK there is no snow on the road and life carries on as normal but when there is this much snow and ice they are prepared for it. We had to make a change at Fortezza for our train to Brunico, we were running late due to some checks that were carried out at the border and had a 30 minute wait for the next train, it was getting dark at this point and there was little or no snow. Travelling with the quantity of luggage we have is a tricky process, not only do we need enough warm clothing to protect us in sub-zero temperatures but also all of our tools for hacking and carving the snow. The chain with the bolts through for sawing the snow weighs 3kg on it’s own. We were welcomed to the Hotel Majarei in San Vigilio Di Marebbe and shown our home for the week, a beautiful apartment with delicately painted doors, sturdy Austrian wooden furniture and ornately decorated balconies and most importantly comfy beds. On Tuesday morning we were welcomed in the town for our pre-carving briefing and the block picking, we were no. 5 so right in the middle which was great, The snow was created artificially (but just water) as there had been no snowfall. It was great quality and shone blue. They are 10 metres cubed. We had the Serbian team on one side and one of the Italian teams on the other. Once we had drawn the design on the surface, the first job was to saw the 4 corners off, like chopping a tree we hacked in underneath so once we were through it would fall off. The next job was to cut the corners off the corners to create the sphere. More difficult that it sounds on this scale. The hand developed gradually along with the curve of the sphere. The tools we use are a mixture of gardening implements, sharp metal chisel like tools and sanding blocks made out of old cheese graters. Here are the final finishing photos from our carving and some of the other teams. We are off to San Candido next to carve our next snow sculpture, loosely inspired by the 3 wise monkeys. We have 3 more days and the winners will be announced on Wednesday evening. If you would like to see more up to the minute photos you can follow our progress on my facebook page. The last stonemason’s festival that I took part in was in Ludlow in 2012. The subsequent 5 years would see me organise 3 more festivals and help raise money for The Llanthony Secunda Priory in Gloucester. They are open to the public now after alot of hard work by the trustees and also thanks to all the stonemasons who took part in my 3 festivals held here. I am looking forward to taking part in some stonemason’s festivals next year but 2019 is going to start with a snowy adventure as I have been invited once again to take part in not one but two back to back snow carving competitions. There are three of us on team GB and we will start out in San Vigilio where we will carve my design, called “fate of the world”. We will be provided with a 10ft cubed block of compacted snow and just 3 days. We will then be transferred over to San Candido, where we will carve my team captain’s design based on the three wise monkeys. More recently I have been working on a new carving from an old design, it was the carving that I designed for the Ludlow carving weekend but as with all events such as this we pour out heart and soul into our carvings and then they are sold to raise money for charity and we never see them again. 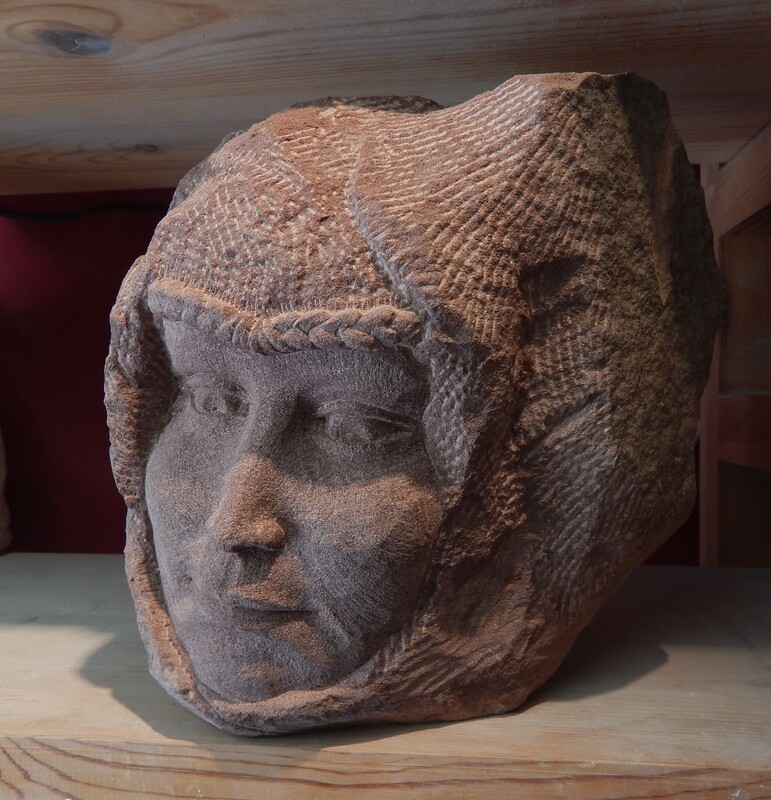 I did actually bid on my carving as I genuinely wanted to keep her but luckily for St Lawrence’s Church I was outbid and she contributed £640 to the restoration fund. 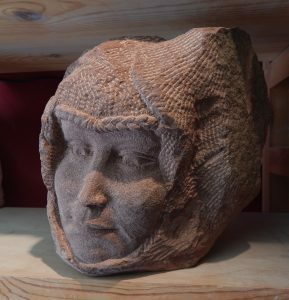 This carving is half the size and carved from Lepine limestone, using this stone meant that I could carve more detail, as I wasn’t working to a clock I could also finish her as I had originally intended. This carving took me roughly 70hrs. I put 2 pictures on because I couldn’t decide which one to use.